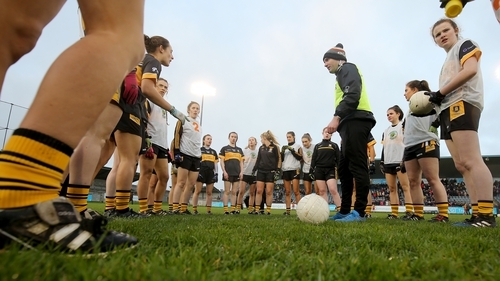 Mourneabbey didn’t spend long lingering over their third All-Ireland final defeat last year. Instead of giving themselves a chance to grieve, they immediately switched their focus to the 2019 season. And they ensured that their manager Shane Ronayne was going to be with them. Ronayne had been in charge of Mourneabbey since 2014 and was almost certain that now was the time for him to step away. Three All-Ireland final defeats in four years was more than enough suffering for him. But Mourneabbey’s O’Sullivan sisters, Ciara and Doireann, made a vital intervention before he could make a final decision. The team had just stopped in the Poitin Still pub on the way home from that All-Ireland final defeat to Carnacon last December when the pair approached Ronayne. "Ciara and Doireann came up to me and went, 'Shane, whatever you're thinking about doing now, you're not to do it. We want you back,'" he recalls. "They knew themselves and I think that's kind of what drove it. That's what made us come down to the field again. We wanted to take a bigger break, and they were tormenting us to go back. You know, that's the way they are." The O’Sullivan sisters are stalwarts of the club and they both picked up All-Stars last weekend for their impressive performances in a Cork jersey throughout 2018. It was a fourth gong for Ciara, but surprisingly, Doireann was just a first-time winner following a year where Cork lost out to Dublin in the All-Ireland final. The pair are seasoned players for the Rebel county and according to Ronayne, they’re integral to the Mourneabbey cause too. "Doireann is on the scene a long time, I suppose. She's still young but when she played her first All-Ireland final she was only 17, she was still in school. She's been around a lot. She's been very unlucky with injuries all the time. "There's always something happening with her. I think she's in the shape of her life at the moment. She still has niggling injuries all the time, in the Munster final she got bad shoulder injury with 10 minutes to go. "They drive it on the whole lot of them. There's four of them there [sisters] and Gerry and Ina, they're very, very honest. "I think everybody looks up to them. They realise that they can't win it themselves but they certainly drive everybody else on. Everybody's got huge respect for them. The respect they show me is just incredible like." "Roisin especially at centre back, I've asked her to do different things this year. She drives it on, she's the real experienced head and she probably doesn't get the credit she deserves - Doireann and Ciara get the scores but I think Roisin drives a lot of the team. "In fairness, they bring every other player on because they want to get to their level. "They're the leaders but they know as well as I do, and the rest of the players, that they're only part of the cog." After committing to another year with Mourneabbey, Ronayne opted to make some changes to the management set-up to get the team up and running for 2018. Those tweaks appear to have worked so far with Mourneabbey completing a Cork and Munster five-in-a-row on the way back to another All-Ireland decider. But while the Clyda-based outfit seem to be picking up silverware at their ease, Ronayne insists that this has been their most difficult campaign so far. Their Munster final clash with Waterford champions Ballymacarbry went down the wire and Mourneabbey had just four points to spare at the final whistle. "Ballymacarbry was a huge game, they really put it up to us," says Ronayne. "We had the wind against us, there were too many fires to be put out. There wasn't just one or two going bad, we had five or six or seven of them going bad. In fairness to them, they just turned it on and they played mighty football for the last 20 minutes. "They just blitzed them, we won by four and we probably could have won it by more. They were comfortable going down the last five or six minutes. Those hard games have really stood to us this year." Another All-Ireland final beckons for Mourneabbey on Saturday where Dublin champions Foxrock-Cabinteely will provide familiar opposition. The sides met in last year’s All-Ireland semi-final with Mourneabbey coming out on top on that occasion. The Cork side will be looking to draw a psychological edge from that result when the pair collide again in Parnell Park. And after enduring so much heartache in previous deciders, they know that there might not be many chances left for them in the future. "I think Mourneabbey will never see anything like it if they do [win]! It's a Holy Grail. Look, nobody has any God given right to win anything and we know that in Mourneabbey better than anybody. We know that we could play at our best Saturday and still not win. "Nobody has any God given right to win anything"
"There's such drive within them, they have that monkey on their back and they'll want to win it so badly. I suppose that's something we've tried to take away from it this year. We're not talking about winning it, we're just talking about us performing. If we can perform, we will win I think. "That's not being disrespectful to anybody. I think if we perform, we'll win. If we perform and we don't win, well then hats off to Foxrock. It'd mean an incredible amount to them, it's probably some of their last chances."